Norfork Lake is in spring fishing mode. 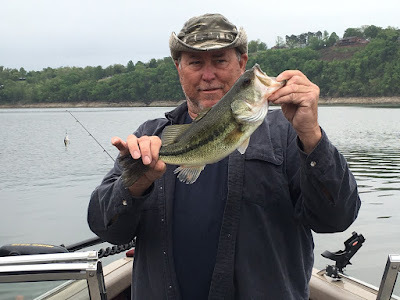 Top water action for striped/hybrid bass, largemouth bass and white bass has started in the early morning, as well as late in the day. Largemouth, smallmouth and spotted bass have moved to the banks for their spawn. Some of the bass are starting to move off the beds, but many are still on their beds. Shad have also started their first spawn of the year. You can find shad early in the morning up on the banks and I have also felt the eggs on my dock. I found out this morning that the shad spawn is making the fish very active. I am going out on a limb to say that if you want to catch striped bass, largemouth bass, smallmouth bass and white bass it is time to come to Norfork Lake NOW!! This is no marketing ploy. I will be able to tell you where to fish and what the best bait for me has been. If you like live bait fishing you will have a blast! peanut butter and jelly color are working as well. Bass are being caught in both the stained water as well as the clear water. Saturday I headed out on the lake around 6PM looking for active fish. As I was almost to my 3rd spot to graph I saw a little flurry of activity from shad on the surface. I stopped and all of a sudden the white bass start busting the surface around me. From 6:30 until the sun dropped below the tree line I caught big white bass. With almost every cast there was a fish on the end. I had my silver Kastmaster with bucktail tied on and I started casting and getting hammered as soon as it hit the water. It was a blast and had me smiling ear to ear! I was sitting in 45 - 50 feet of water on a large deep flat area in front on a small cove/creek. At times the fish erupted in the main channel which was almost 90 feet deep in this area. Keep your eyes peeled at all times especially early in the morning and late in the day, but any species could erupt at any time of day. 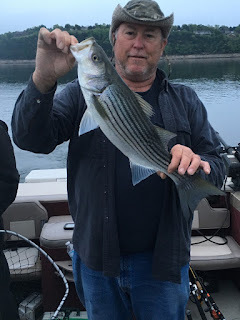 Striped/hybrid bass fishing is also picking up. I myself have mainly been fishing after dark with a shallow diving suspending stick bait until this morning. 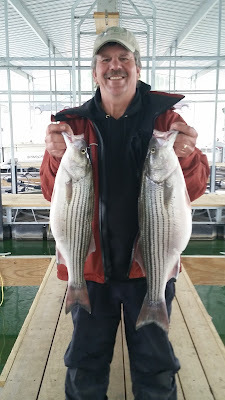 This morning was one of the best days for striped bass I have had this year, so far. :-) I landed over 10 stripers in the 9 - 14 pound range and 3 big hybrids. 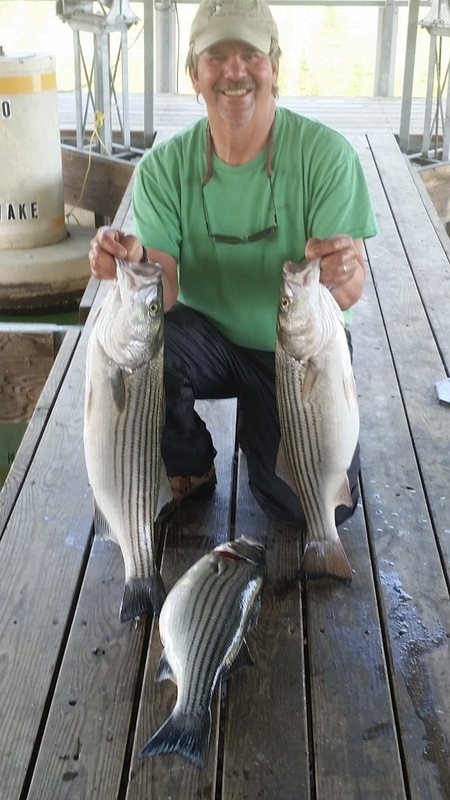 I caught stripers on top water with a Zara Spook as well as live thread fin shad. The stripers and hybrids were just crushing both the live bait and the spook. The shad was working the best. I only had 2 free swimmers out with a very small split shot and could not keep up with all the doubles I was getting. I broke off and bent many kahle hooks. The fish were hungry and aggressive this morning. 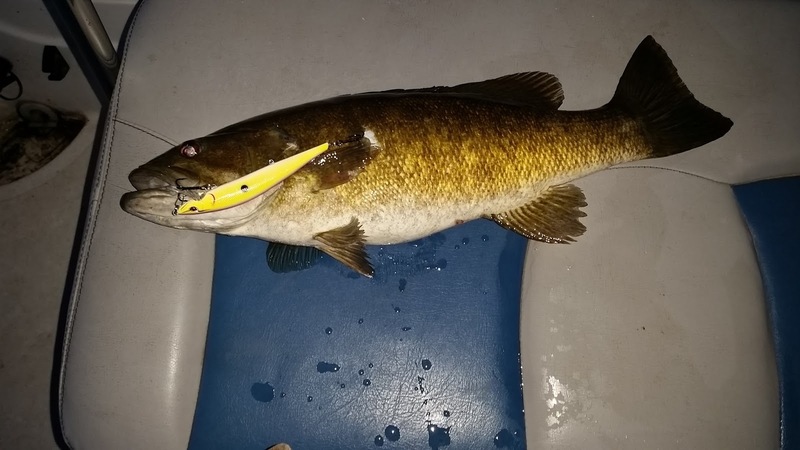 Back to the night bite info - With the full moon, a lighter and brighter color of stick bait has been working. The color that seems to be working the best for me has bright yellow on the sides and bright purple on the top. Before the full moon I was using a dark green color on top and orange on the bottom. I have been getting numerous bites over the last couple of days after dark, but have only been able to boat a couple per night. I can hear the big fish feeding on the surface but they are not necessarily on the banks with this big bright full moon. 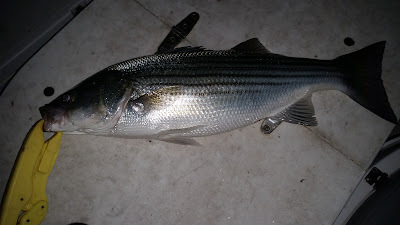 For morning striper fishing, start looking at points especially if you can find some buck brush still in the water. 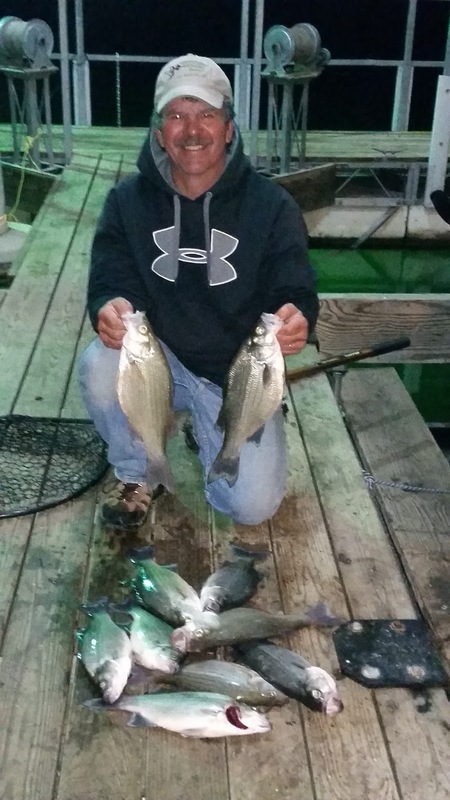 The shad will be spawning in the brush and the stripers will not be far behind. As the sun gets high in the sky look out in the deeper water and you will start marking cruising fish at 20 to 50 feet deep. Crappie fishing is starting to pick up but has not really taken off at this time. Look for crappie back in the creeks on shallow brush. They will be on the brush or suspended between the bank and the brush. Small jigs and crappie minnows will work the best. Norfork Lake level is stable with sporadic power generation for level maintenance and currently sits at 552.90. The main lake is clear on the surface. The creeks were also clearing up but over the last couple of days more color in the water appeared. The lake surface water temperature has risen to the mid 60's and this rise was very quick. The fast rise in water temp. may be the cause of the water color change.